The Passivhaus is the world leading standard in energy-efficient construction: A Passivhaus requires as little as 10 % of the energy used by typical building – meaning an energy savings of up to 90 %. Owners of Passive Houses are barely concerned with increasing energy prices. • Primary energy use may not exceed 120 kWh/m2/yr. 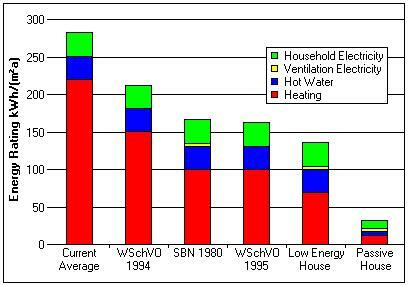 • Passive Houses must be airtight with air change rates being limited to n50 = 0.6/h. • During summer months, excessive temperatures may not occur more than 10 % of the time. The Passive House is a sustainable construction concept that provides for affordable, high-quality buildings as well as comfortable, healthy living conditions. This drawing demonstrates the principles of a heat recovery system: We, along with activities such as cooking, showering, televisions etc. all produce heat. The heat recovery system then uses this to heat the building. Warm exhaust air flows via the extract ventilation system and delivers heat to plates. This exhaust air leaves the unit cooled. On the opposite side of the exchanger plates, filtered fresh air flows in separate channels. This fresh air absorbs the heat from the plates and will leave the exchanger unit with a higher temperature (but still unpolluted). This heated fresh supply air then leaves the unit to be distributed via the ventilation system to the living areas. In low-energy buildings the entire building envelope is highly insulated. The building envelope consists of all the building elements which separate the inside from the outside. Its main purpose is to provide for a comfortable indoor climate – irrespective of the outdoor climate which is determined by the weather. The heat losses during cold periods are thus negligibly small, and the temperature of the interior surfaces is nearly the same as the air temperature, irrespective of the type of heating used. This leads to a very high level of comfort and reliable prevention of building damage due to moisture build up. A thermal bridge is a component, or assembly of components, in a building envelope through which heat is transferred at a substantially higher rate than through the surrounding envelope area. Passivhaus buildings employ ‘super’ insulation to significantly reduce heat transfer through the floors, walls and roof compared to conventional buildings, with special attention given to eliminate thermal bridges. Heat loss from buildings is a continuous process and can increase during the life of the building. Energy in the form of heat or cool is fed into to the building to maintain the required temperature; the two main routes for heat loss are ventilation or fabric (conduction) heat loss. Building envelopes under the Passivhaus standard must be extremely airtight compared to conventional construction. Air barriers, careful sealing of every construction joint in the building envelope and sealing of all service penetrations through it are all utilised to achieve the standard. 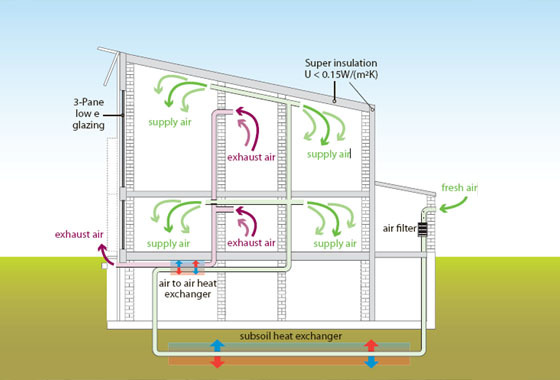 Air tightness minimises the amount of warm or cool air that can pass through the structure, enabling the mechanical ventilation with heat recovery system to recover the heat before discharging the air externally. 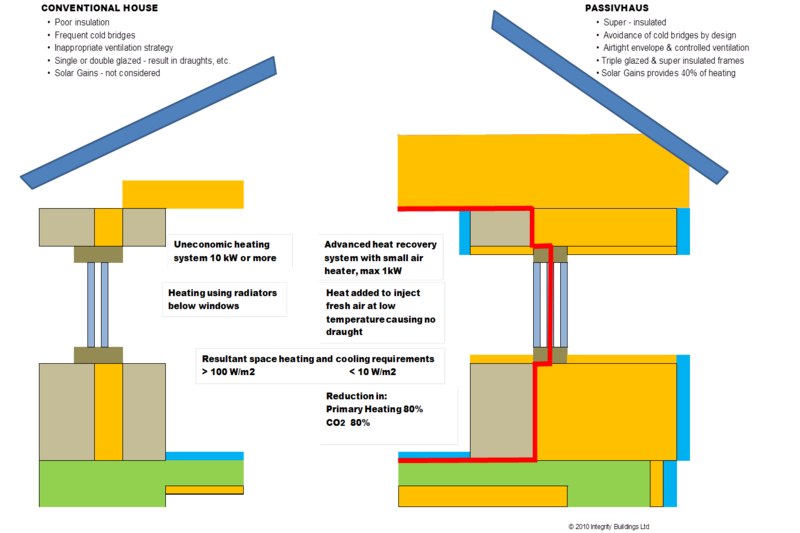 To reach Passivhaus standard, air leakage through unsealed joints must be less than 0.60 times the house volume per hour, this is around 10 times better than a typical new-build house. 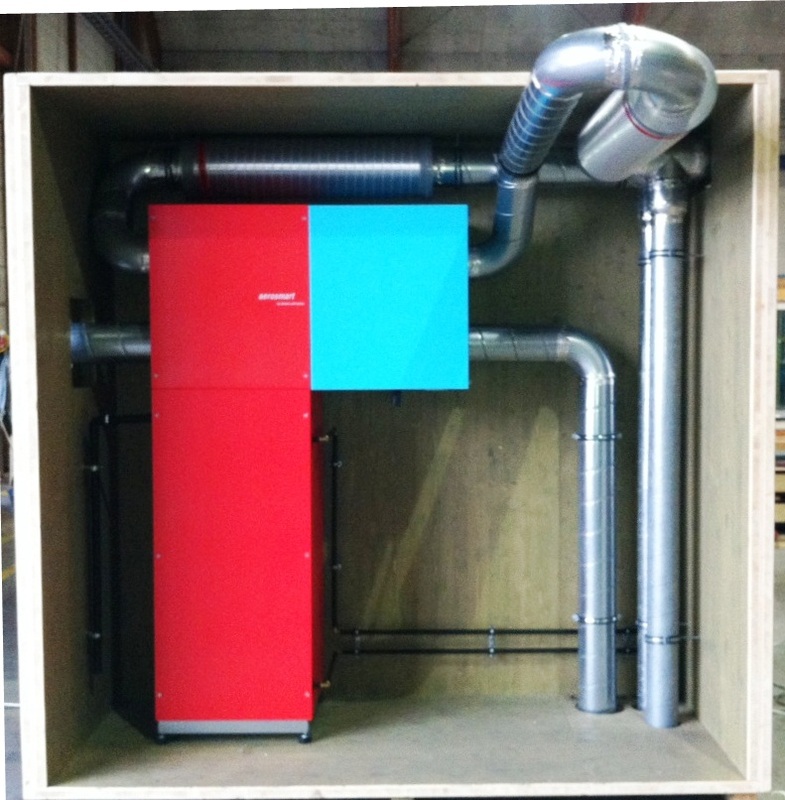 Passing the blower door test is a necessary prerequisite for the functioning passive building. This airtightness layer will be designed at an early stage as a seamless layer, enveloping the entire building. 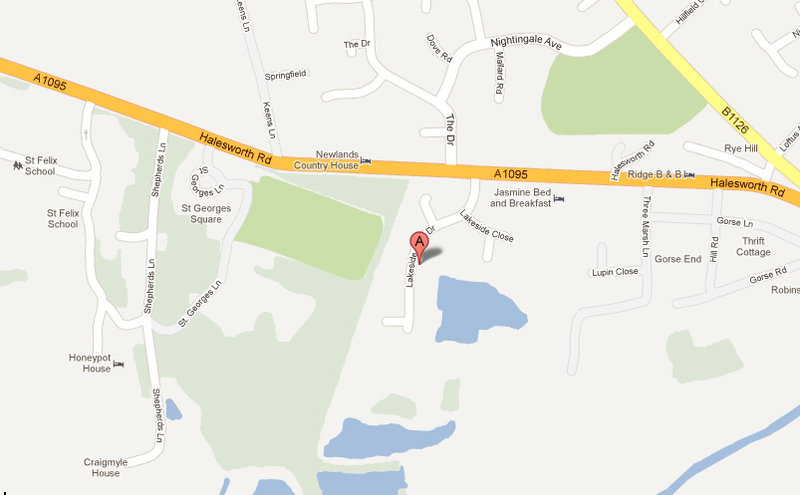 Additional detailing is required at the external windows, doors and foundations. The health and comfort of the inhabitants is the most important objectives of a Passivhaus design. Excellent air quality is vital; this can only be achieved in an airtight house if “used” exhaust air is exchanged with fresh outdoor air at regular intervals. Ventilation will only work correctly if the extract air is removed constantly from the kitchen and bathrooms. Fresh filtered air is supplied to all the living rooms, bedrooms and function rooms, to substitute the extracted air. There is no recirculated air, thus providing a hygienic, filtered, fresh air quality. Due to this principle of directed air flow, the fresh air is optimally utilised: it provides high quality air in the living areas, removes any bad air from the transferred air zones (e.g. odours from clothes), and finally dehumidifies the humid areas. Our fully integrated “Green-Cube” provides heating in winter, cooling in summer and hot water. Windows are an essential factor in assuring pleasant indoor conditions. In cold climates, poorly insulated windows will cause relatively cold surfaces at the facade and will require active heating near the windows to compensate for cold air drops, draughts and “cold radiation” caused by the cold surfaces. These components must be matched perfectly to add up to a window which reduces the heat loss by 50 % compared with good modern standard windows. This reduction is necessary to provide for pleasant internal surface temperatures even during cold nights. Since windows also allow for direct and indirect sunlight to enter the building, Passivhaus windows provide for positive energy balances during cold winters. Whereas conventional windows can be considered “holes” in the facade through which great amounts of energy are lost, Passivhaus windows allow for net energy gains, provided that excessive shading is prevented and that they are facing anywhere between south-east and south-west. A window allows for direct and indirect sunlight to enter the building. The solar heat gain coefficient indicates the fraction of solar radiation admitted through the glazing at normal incidence. Windows which meet the requirement will allow for passive solar gains which more than compensate for the heat lost through them.